OverDrive downloads reach 4 million! Checkouts from Auckland Libraries’ main digital reading platform, Overdrive, reached 4 million this month, making us some of the biggest digital library borrowers in the world. Auckland Libraries is now eighth in the world for Overdrive checkouts and one of only two libraries outside of the United States to hit 4 million checkouts. 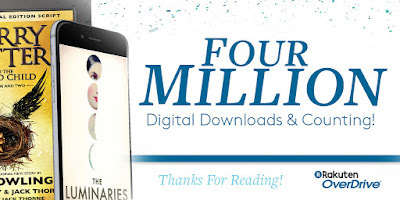 We join Toronto Public Library, New York Public Library, Los Angeles Public Library, King County Library System, Cuyahoga County Public Library, Boston Public Library and National Library Board Singapore in the 4 million club. Since November 2013, over 78,800 people have checked out at least one eBook from Auckland Libraries' Overdrive collection and this figure continues to grow, hitting an average of 27,543 eBooks borrowed per week this November.